Personal ideas about quality child care differ greatly in today's society. Our very own values, beliefs, cultures, backgrounds, and environments contribute to how we determine what quality looks like. What is Guiding Stars of Duval and How Does it Measure Quality? Guiding Stars of Duval is THE quality rating improvement system for child care providers in Duval County. Both, child care centers and family child care homes can volunteer to be a part of this program. Participants in Guiding Stars commit to not only meeting the basic requirements for licensing set by the State of Florida, but they also agree to hold themselves accountable to higher standards by providing quality education and by helping children prepare for school. Through participation in Guiding Stars, child care programs are measured on important indicators and standards, such as teacher education and training, teacher-child interactions, child screenings, and curriculum. Ratings range from 1 star to 5 stars. The chart below explains what each level represents. What Should I Look for in a Child Care Provider? Choosing a child care provider for your family is one of the most important decisions you will ever make as a parent. Therefore, the link below contains a quality checklist to help guide you in your decision-making process. Since the Department of Children and Families is charged with monitoring licensed child care centers, it is also important to review their DCF record before making a decision. Click on the link below to check past inspection reports. 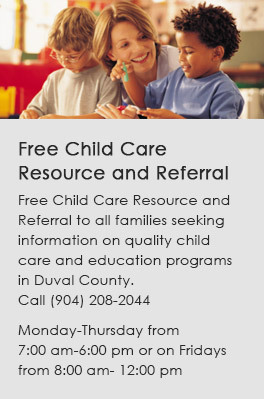 Where Can I Find a List of Child Care Providers that Contract with the Early Learning Coalition of Duval? Faith-based Licensed Exempt Child Care Centers: The Department of Children and Families (DCF) DOES NOT have to monitor these providers. If they have School Readiness children, DCF does conduct monitoring or the Center must provide proof they are monitored by their faith-based affiliated agency. Licensed & Accredited Child Care Centers & Private Schools: DCF monitors these providers and issues their licenses. A Florida recognized accrediting agency must issue any accreditation. Licensed & Accredited Family Child Care Homes: DCF monitors and issues all licenses to these providers. A Florida recognized accrediting agency must also issue any accreditation. The provider can have no more than 15 children in their care. Licensed Child Care Centers & Private Schools: DCF monitors these providers and issues their licenses. Licensed Family Child Care Homes: DCF monitors these providers and issues their licenses. The provider can have no more than 15 children in their care. You can also click on the box above to see all child care options.